The source of dunes in Chasma Boreale. This image shows dunes during the summer, when they were free from the seasonal layer of carbon dioxide ice that covers the region for much of the year. These dunes, which are near the head of the largest trough in the North Polar cap (called Chasma Boreale), were formed by strong winds blowing down the canyon toward its mouth. 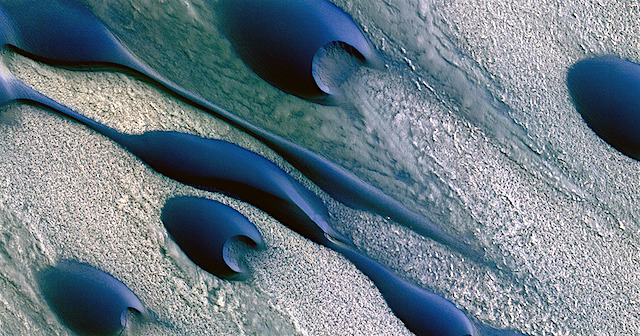 This entry was posted in Reports and tagged Beautiful Mars, Chasma Boreale, dunes, High Resolution Imaging Science Experiment, HiRISE, Mars Reconnaissance Orbiter, MRO, NASA, north polar ice cap, sand dunes, University of Arizona. Bookmark the permalink.